July 4 today ... my National Day! And one person, the intrepid Colonel Sinclair in Kentucky, my fellow Ky. Col., sent me a card? Were I in better shape I would go to the American community's big event, but instead I'm sitting here doing this blog. You'll see here a mockup poster for Butterfly; that's one of the things I ended up having to dash off in the middle of the night; I think that for the next week the opera is still going to be suddenly turning to me for something which should really be done by someone else but never has been ... but that can't be helped yet. In a sense, this illness is the best thing that happened to me and to the opera company itself. 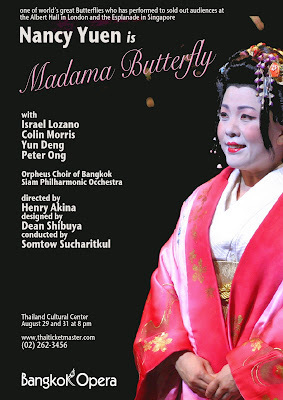 Tomorrow, rehearsals for the chorus of "Butterfly" are already starting up with the resourceful Dominic Sargent at hand. Tomorrow, too, I return to the hospital, but hopefully not overnight. A few days ago, Trisdee returned from the Netherlands and has now learned to do an astonishing Elton John imitation. I can see now that my funeral requiem will be a lot more like Princess Diana's than I originally thought. I'm preparing myself for attachment to the machine for the evening by reading The Gulag Archipelago. For some reason, despite being a literate person, I've managed to avoid the book so far. Right now I am reading all about Soviet interrogation techniques. Ouch! So, okay, I'm sorry I publicly accused the Ministry of Culture of being Stalinist when they tried to censor my opera. After all, theirs was not a carefully thought out campaign of terror, but merely the power grab of some bureaucrat who never thought it would actually backfire on the entire ministry... Besides, our government is gradually coming round to a proper idea of supporting the arts. It's growing pains, I suppose.